Hitchhiker Claire Olger is charged with grand theft auto and manslaughter when the driver of the car she's riding in hits a truck, killing the truck driver, then flees the scene, leaving Claire to take the blame. Perry agrees to help Claire and eventually does locate the missing driver. Trouble is, he's dead. Burger drops the previous charges against Claire and files a new one: first degree murder. A second murder only complicates things more. CARS: 1957 Lincoln, 4dr sedan, black. From The Cars by Greg Cockerill. The Pitkin Principle (from Episode #18) Strikes Again: Michael Greeley's name in the original ESG novel was Adler Greeley. Submitted by BobH, 10 January 2016. At the end of this episode, Lt. Tragg moans, �Oy gevalt� when Mason explains how he cracked the case. This a Yiddish expression that translates as a combination of amazing and awful. Any other examples of Yiddish in the series? Submitted by Rabbi Mayer Schiller, 7/23/2007. At the beginning of the show Perry is wearing a light-colored (maybe it is tweed) suit coat instead of his usual dark-colored jacket. The coat definitely does not match his trousers. Submitted by PaulDrake 33, 10 February 2010. Uncredited Actors: This episode is another double bill for Don Anderson. In the murder investigation scenes, he wears a pair of glasses and a white lab coat to play a police lab man whom Tragg addresses as �Crane,� though Anderson has no line in return. In the courtroom scenes, he appears without the glasses as a spectator on Mason�s side of the courtroom. Submitted by FredK, 30 September 2010. Character Names: Tanner�s frist name is Ernie. Submitted by gracenote, 8/29/2011. Sightings: In the courtroom gallery sits a bespectacled man we call Distinguished Gentleman #1, in at least one close shot. But who is he? Submitted by gracenote, 8/30/2011. + Also among spectators we find Distinguished Lady #4. Submitted by gracenote, 9/6/2011. ++ Distinguished Lady #4 also shows up at the Murder hotel as she gets off the elevator. Submitted by BigBill767, Nov 11, 2016. Paul Drake says Jerry Heywood makes $3,000 a week or $156,000 a year. That�s $1,146,653.98 today. Della�s right, even for two, that will work. Submitted by billp, 1/1/2009. It rains in this show, so we get a chance to view Perry�s stylish raincoat. Note the handsome checked lining. Submitted by gracep, 17 December 2010. The two young protagonists in this episode stay at the Gateview Hotel for $4.50 per night. In 2011 dollars that�s still only $35 and change. You can�t even stay in a fleabag in a small town in rural upstate New York for so little, much less in San Francisco, I would imagine. Even the roach motels around here cost nearly $60. If you want to be safe, expect to pay $100 a night or more (and again, that�s in rural areas). So, evidently, hotels used to be much more affordable in the 1950s (though I�m sure the Gateview Hotel is on the low end). + Yes, they were more affordable. $4.50 is below the (single) $5.91 Average Daily Rate (ADR) for 1950 but doesn't seem like fleabag territory. Even the ADR for 1960 was only $10.81 (doubled from 1950!). See here. Note that the rates have risen by a factor of 1.5 to 2 each decade! Bad Accent Dept. Another poor outing belongs to Fredd Wayne, who plays Tanner in this episode. In some scenes he even forgets his Cockney accent, such as it is. Submitted by Francis, 5/20/13. Bumbling Media Dept. (tip of the Titfer to Francis above) Just as in episode #17 (Sun Bather's Diary), the 1957-1958 LA media here evidently does not always let the facts get in the way of a good story. In #17, a radio news announcement mentioned "Frank" rather than George Ballard. Here in #19 a newspaper headline and article have Michael "Greely", even though the episode's end credits have "Greeley". Also, according to the "Charged With Theft And Manslaughter" photo caption referenced above, Miss Olger's alleged driving killed a soldier, not a truck driver. Submitted by (lowercase, with a comma and period) masonite, 07/20/13, and updated 2/12/16. + Miss Olger was wearing gloves in the car with Michael Greeley, which could have smeared previous fingerprints on the steering wheel and key. After she claimed to be only a passenger in the car, why didn't the police check for any clear fingerprints on the steering wheel, key, and door handle? Or any substance transferred from the pedals to her shoe? lowercase masonite, 2/12/16. Bus Stop Confidential When Mrs. Greeley is questioning Paul on how her husband could have gotten home from the accident, he replies that there was a bus stop nearby, and "there's also hitchhiking"; keep in mind the location was a(n apparent) back road more than twenty miles from LA - by the road sign seen earlier - and at night...apparently public transit was a lot easier in the 50's. Commented by Notcom, 080416. I'm not sure why Michael Greeley is described as blonde. Claire Olger has only seen him with his hat on and his exposed sideburns and hair on the back of his next appear dark. When his body is found his hat is off and again his hair appears dark. Submitted by Kilo 3/9/2018. Seems to me Claire Olger would most definitely want Greeley alive - would have been easier to prove her story true. 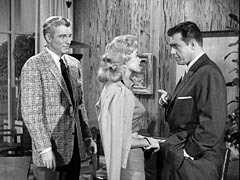 Double double trouble Second consecutive episode where the killer murders two people, and in both cases one of them was a scheming manservant. Submitted by Notcom, 080416.